Bloomsbury Publishing PLC, 9781608190850, 248pp. Mesmeric, mournful, and intensely lyrical, "Chef "is a brave and compassionate debut about hope, love, and memory set against the devastatingly beautiful, war-scarred backdrop of occupied Kashmir. Jaspreet Singh is a former research scientist who holds a PhD in chemical engineering from McGill University. His debut collection of short stories, Seventeen Tomatoes: Tales from Kashmir won the 2004 McAuslan First Book Prize, and his stories have appeared in The Walrus and Zoetrope. Born in Punjab and brought up in Kashmir, Singh now lives in British Columbia. Discuss the setting of Chef. If Kashmir is considered a “shadow of paradise” (13), why does Kirpal sense “a mingling of sadnesses here” (41)? Whose sadness is evident in Kashmir? How does the mood of the state relate to its natural beauty? Explain Kirpal Singh’s reasons for returning to Kashmir after a fourteen-year absence. What does Kirpal seek in the valley city of Srinagar? What does he ultimately find there and what disappointments await him at the end of his journey? What does the army expect of Kirpal when he first arrives to serve General Sahib? How does Kirpal, in turn, meet and thwart the army’s expectations? What role does Kirpal’s father, Major Iqbal Singh, play within the army’s expectations and Kirpal’s ambitions? What are Kirpal’s first impressions of Chef Kishen? How does Kirpal’s relationship with Kishen change over the course of the novel? What important lessons does Kirpal learn from Kishen, and where do the two chefs radically diverge? Much of the action of Chef takes place in memory, as Kirpal looks back on past events during his journey back to Kashmir. What is the effect of this retrospective view? What attitude does Kirpal seem to have toward his memories of Kashmir? Several love interests cross Kirpal’s path: Patsy Chowdhry, the Kashmiri woman washing apples; the nurse; and Irem. Why is Kirpal attracted to each of these women? Why has Kirpal remained single all these years? Discuss the differences between Kishen and Kirpal’s styles of cooking. What are the signature dishes of each chef? What techniques and philosophies of food does Kirpal learn from Kishen, and what styles does he develop independently of his mentor? How does Irem also influence Kirpal’s approach to cuisine? What emotional and physical effect does the Siachen glacier have on Chef Kishen? Discuss his scene of violence and suicide on the glacier. What is Kishen protesting? How does Kirpal react to Kishen’s revolutionary actions? Was Kishen’s protest effective in the end? Why or why not? Rubiya grows up in the years of Kirpal’s absence from Srinagar. How has Rubiya’s life changed over the past fourteen years? What realizations does she have about the political situation between Pakistan and India? How does her poetry and journalism express these realizations? Whose form of political protest seems more effective: Rubiya’s or Kishen’s? Why? What effects from the brain tumor does Kirpal begin to see and feel on his journey from Delhi to Kashmir? How does he seem to be dealing with his illness? How does General Sahib’s death affect Kirpal’s chances of recovery? Rubiya writes, “I feel the story of Soofiya [Irem] and little Naseem is the story of the whole of Kashmir” (233). How does Irem’s story represent the beauty, troubles, and conflicts of Kashmir? Is Irem a terrorist, as accused? Why or why not? Thinking about his ailing mother, Kirpal realizes, “Cooking was her way to say how she felt towards people close to her” (246). How does Kirpal also use cooking as a means of communication? In which scenes does Kirpal attempt to express his feelings through food? Discuss General Kumar’s leadership in Kashmir. What sort of leader is he? What relationship did he have with Major Iqbal Singh, Kirpal’s father? How does he fare during military scandals, such as Colonel Chowdhry’s “coffin scam”? How have politics affected his personal and family life? 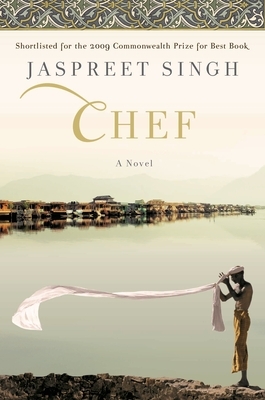 Chef includes a hand-drawn map of the Siachen glacier, a complete recipe for Rogan Josh, and lines of Arabic script that depict Kirpal and Irem’s first conversation. What do these extra elements add to the experience of reading Chef? Discuss Jaspreet Singh’s writing style. What passages of Chef are particularly poetic? How does he bring the landscape of the Kashmiri valley and the Siachen glacier to life? What foods are described in particularly lush detail?